On 1st March Virgin Trains East Coast commenced operation of the Inter City East Coast franchise superseding the government owned company Directly Operated Railways. The company (90% Stagecoach and 10% Virgin) has acted quickly to re-brand it's trains with large Virgin stickers. Already some of the Intercity 225 trains have been revealed in a totally new livery. The EC HST fleet will not be the first to wear Virgin colours although the scheme does differ from the previous livery seen on West Coast and Cross Country HST's which operated in Virgin days. 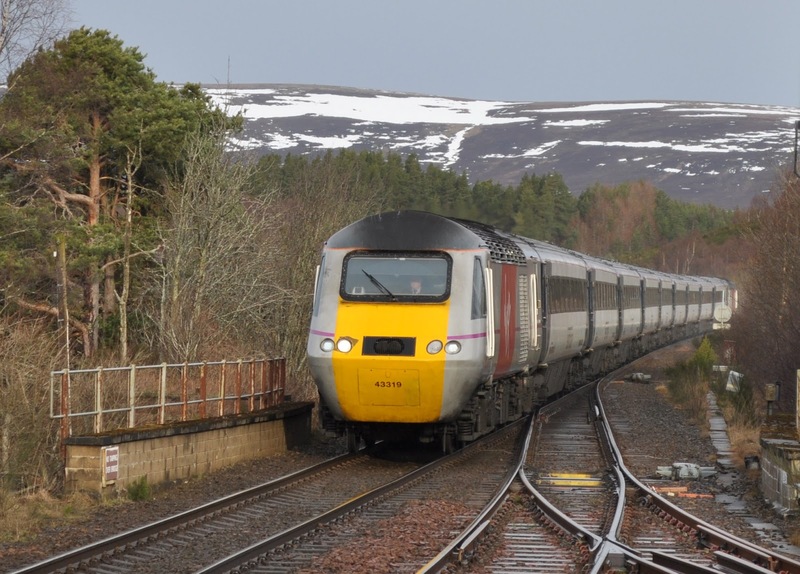 The interim livery is seen here on 43319 as it passes non-stop through Carrbridge on the Highland Main Line with the 'Highland Chieftan' to London Kings Cross- one of the longest continuous rail journeys in the UK.